Jaber is a hardworking full-time artist respected around the world that began putting his name up in the Bay Area in the early 90’s. Jaber, a.k.a. 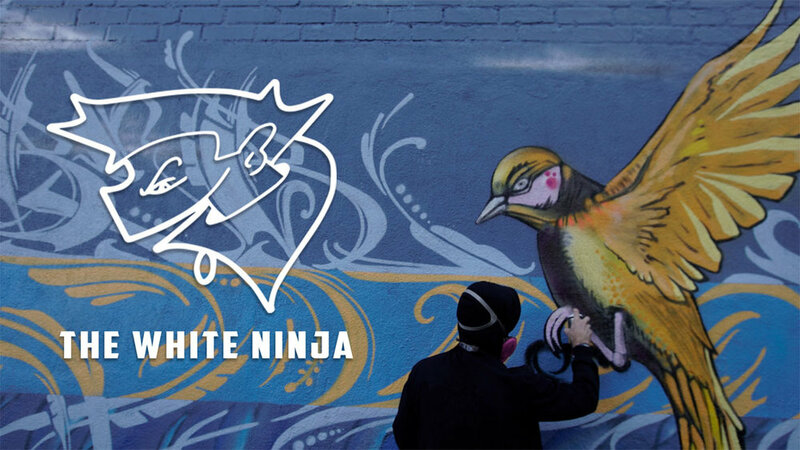 the White Ninja, resides on the west coast, and has shown work all over the United States and Canada. What sets Jaber apart from regular graffiti artists is the amount of diverse styles he has gone through and the consistency of quantity he puts out. He is always brainstorming on new ways to get his message across. Jaber has also spent some time in Seattle Washington and Orgeon as well. While in Seattle, Jaber continued his craft with major projects for Public Utilities, Seattle Super Sonics Basketball team and many more companies in Washington to do design and create murals. In 2004 he began touring with major acts like The Roots, John Legend, A Tribe Called Quest, Busta Rhymes, and more doing live painting for the shows. Jaber currently works as a Production Designer for films, creates and designs backdrops for major parties, and creates designs for fashion brands. His artwork is featured in many graffiti publications, train magazines, and books. Currently he is booking shows all through the U.S. and Europe. Jaber is a full-time artist that began putting his name up in the bar area in the early 90’s. Though he resides in the west coast, he has shown work all over the United States and Canada. What sets Jaber apart from regular graffiti artists is the amount of diverse styles he has gone through and the consistency of quantity he puts out. He is always brainstorming on new ways to get his message across. While in Seattle public utilities, Seattle super Sonics basketball team and many more companies in Washington to do design or create murals.